April DSMA Blog Carnival: Surviving Social Media Burnout. What are some of the things we can do to prevent social media burnout? Especially when we have months like this one, right? That New York Times story has had Twitter, Facebook, and blogs buzzing for two weeks. At moments like that, it’s easy to burn yourself out. Talk to your spouse once in a while. Take the dog for a walk. Play with your kids. Trust me, those tweets aren’t going anywhere. Facebook will still be there, faithfully waiting for your status update. This is not my job. And oh, by the way, social media was here long before I created a Twitter account, and it will be here long after I’m gone. And let’s not forget something that really helps addict us to our smartphones and tablets. All of us, I think, have had a positive experience, or several, or several hundred, via social media. Who wouldn’t want that to continue? When you think of likes or followers or uplifting comments, and the way those make you feel, it’s easy to understand someone’s motivation for blogging and tweeting and instagramming and storifying themselves into a perfect computerized glow of co-dependency. We don’t want the love to stop. If that’s you: You need a vacation. At least once a year I go on vacation, for maybe a week. When I do, I also take a social media break. I don’t check my email, or my blog, or Twitter, or Facebook, or Instagram. And two things happen. I don’t miss it, and I find myself with renewed energy and sense of purpose. I feel like I can embrace social media again, rather than feel enslaved to it. Oh yeah, we’ve all been there. It’s okay to admit it. Social media burnout does occur. When it does, remember that it’s okay to step away, take a break, enjoy the other great things in your life, even take a vacation from it for a while. Don’t worry… we’ll all be right here when you come back, and we’ll be very interested in what you’ve been up to! Go make some offline stories, then fill us in when you return. We’re looking forward to it. When we come back from the walk/date/vacation of our own. This post is my April entry in the DSMA Blog Carnival. If you’d like to participate too, you can get all of the information at http://diabetescaf.org/2014/04/april-dsma-blog-carnival-4/. Wordless Wednesday – Tangible proof. I received this in my e-mail this week. It’s a great feeling when you get tangible proof that something you’ve done will help someone else. 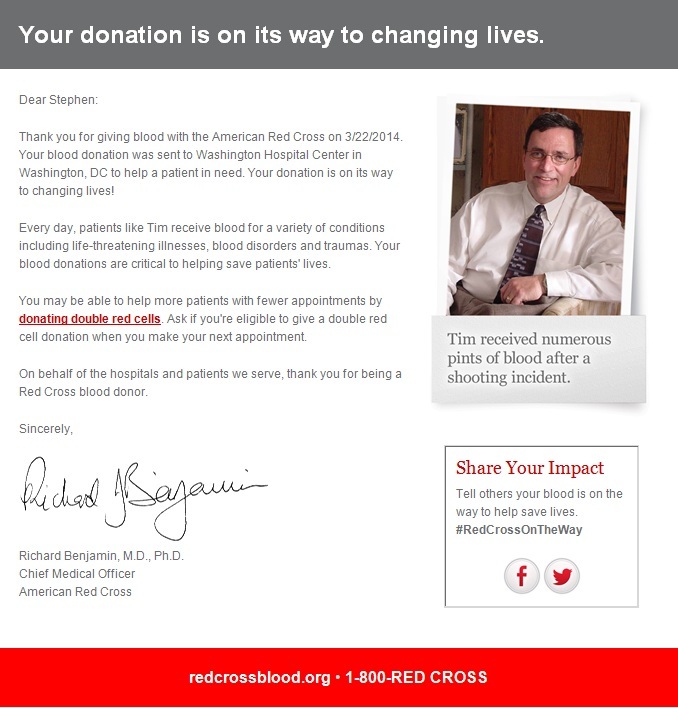 If you’re living with diabetes and living in the USA, you may be able to donate blood. To find out more, go to redcrossblood.org. What a beautiful weekend of weather we just experienced here in the Mid-Atlantic. Sunny days, highs in the 80s. The Great Spousal Unit and I worked on getting things uncovered and cleaned up on our screened porch off the back of our house. These are the days that feel just fantastic outside. So I was certainly excited at the possibility of getting on my bike for an actual outdoor ride for the first time in six months. I had too much to do on Saturday, so I knew Sunday was the day. On Sunday, there were pressing issues at home that required my attention. But I planned things out so I could do my ride beginning at 2:00 in the afternoon. I had a high-carb lunch about 12:30. I made sure not to bolus too much, knowing I would be out in the hottest part of the day burning off those carbs. I got my bike out, checked everything to make sure it was okay, inflated the tires, and changed my clothes. To be sure, I did a quick glucose check before I got started. What made it worse was the fact that I still had a unit and a half of insulin on board. So I knew that even after stopping my pump and ingesting a few more carbs, it would take a while before I could raise my BG to the level that I would feel safe riding for an hour. I decided to just bag the ride and try to head to the gym on Monday morning before work. I don’t generally go around feeling like everything is my fault. But if I ever do, it’s at times like this. I can’t tell you how much I wanted to ride this weekend. And when that 55 came in, I was pretty unconsolable. I’m feeling pretty out of shape (pretty much like I have at this time every year for the past thirty years), and I hate when I miss opportunities like this weekend. But… I’ve got to just stop it already. Sure, Sunday’s ride was a bust, and I think it’s okay to be very unhappy about that. But I also know I can’t change it now. The only thing I can do is the absolute best I can do today. Yesterday was a point of disgust for me. I’m not above using it for motivation to crush those feelings of feeling crushed today and the rest of this week. I hope you’ll join me in feeling that way, both about my preparation for the ADA’s Chesapeake Bay Tour de Cure in May, and about your daily journey with diabetes. It’s not about your diabetes. At least it doesn’t have to be about your diabetes. It can be about the great life you’re living. Or at least about the inspiration you provide in trying your best every day despite this stupid diabetes. Just stop it already. You are worth the journey. And you are worth far more than whatever you’re going through. Beginning a year (or less) of discovery. That noise you hear is the sound of my pump warranty expiring. Didn’t think it sounded like that, did you? My insulin pump is the Medtronic Minimed Paradigm® Revel 723 pump. It’s the only pump I’ve ever worn. It’s still going strong, pretty much like it was back in August of 2012 when I wrote this post. I’ve been more than satisfied with its performance. First, I have about a year’s worth of infusion sets and reservoirs to use up. I should have stopped that automatic 90 day refill of supplies, but I didn’t until now. Even if I go to Med-Ts newest offering, the 530g with Enlite, and I can use the same stuff (I think I can use the same stuff… anyone? Bueller? ), I would like to start over with a clean slate of durable medical supplies. And if I don’t move to the latest Minimed product, I would hate to waste all of those reservoirs and sets. I don’t think that would be fair to my insurance plan, my employer (who pays most of the cost for that plan), or the larger cost of care for a chronic condition in America. Which brings me to my second reason: Unlike the last time I chose a pump, I’d really like to do some shopping around to see if there’s a better option for me. Maybe the new Medtronic pump/CGM/With the Threshold Suspend Feature is just what I need. But I won’t know unless I try out other pumps too. If I give myself six to nine months to do some deep dives into functionality, ease of use, etc., I think I should be able to cover everything the market has to offer (and has available in the USA) right now. Third reason: Giving myself that long to make a decision also gives me a little more time to get feedback on more recent entries into the market. Hopefully, several more months of reports and anecdotal evidence from my DOC peeps will help me make a more informed choice. You can’t always time these things out perfectly (where are you, Animas Vibe? ), but if I see someone who’s recently chosen a product talking about how things are better or worse for them than when they started on said product, I’ll feel better about my choice. The sales effort has already started with my current pump maker. I received a call from Leslie from Medtronic on Tuesday. She reminded me that the 530g “is the first pump moving toward the artificial pancreas with the threshold suspend feature”. I thought I heard back in January that Medtronic heard the Diabetes Community when they expressed concern that the term Artificial Pancreas was a bridge too far. My conversation with Leslie (where I heard that phrase twice), a check to their website twice (in December and this week), and a call to their main diabetes line (1-800-Minimed) twice tells me there is still a disconnect. Not a good start. Despite that, I haven’t made up my mind yet. I’m still listening. Ideally, I’d like to actually try out each pump for a couple of days. My guess is that’s not possible. I was told by Leslie from Medtronic that I can’t do that, but if I want to have them submit the paperwork to my insurance, they can help me get the 530g system, and if I don’t like it, I can always send it back within 30 days. Sorry, but paying people to do lots of paperwork, get a prescription from my endocrinologist, package the goods, send it to me, and possibly pay to have me send it back is too much money just for one person to try it out. Again, I would feel incredibly guilty about that. I just want to try it out for a few days before I make a commitment. I will not make my next insulin pump choice without at least seeing it in person. I want to touch it, see how the bolus feature works, see how the basal feature functions, how the reservoirs are filled, and what the infusion sets are like. I want to examine the cost, investigate the customer service, government recent recall notices, and anticipated FDA approvals. And I want to read and hear present, and future feedback from my fellow members of the Diabetes Community. The clock begins now. It ends when I make a decision. So here we are. Or here I am, staring at another birthday (52) and another blog anniversary. 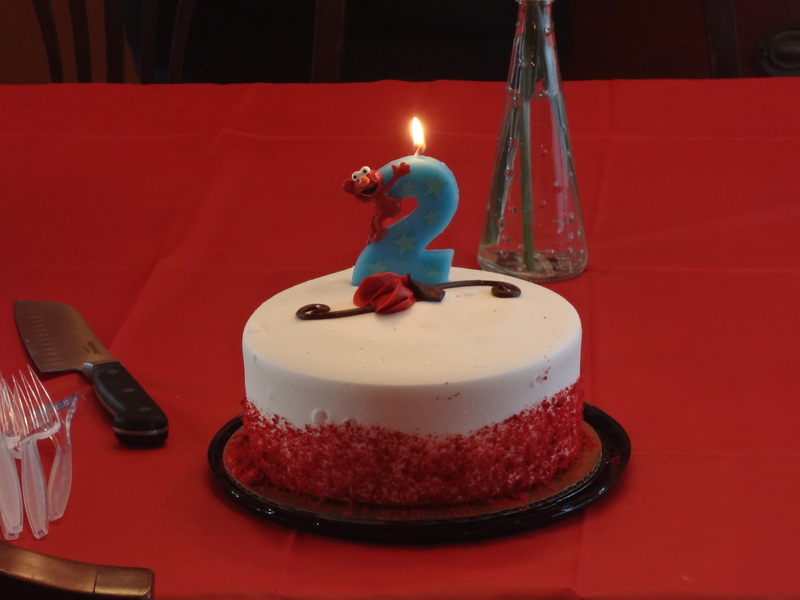 By the way, my great niece, also born at this time two years ago, is doing great and laughs a lot and looooves Elmo. Two years ago today I published my first post at Happy-Medium.net. Since then, there have been 360 additional offerings. Holey Moley, that’s nearly one every other day! If you asked me if I could write like that two years ago, I’d say yes… I can write about anything. But I wouldn’t have guessed that the subjects here would be so varied. At the two year mark, there’s one thing that worries me more than anything else. I must get two or three e-mails per week nowadays from individuals or organizations that are looking to spread their message. Whether they’re promoting upcoming events, pitching a product, or have a cause near and dear to their heart, they ask me to say something about it. I almost always say yes to the individuals, and sometimes say yes to the organizations. But here’s the thing: I worry that telling someone else’s story so much leaves little time for telling my own. I want to remain a strong supporter. I’m good at that. But part of my mission for this blog is to leave a written record of what it’s really like to live in my shoes on an ongoing basis. Selfish? You bet. It’s my blog. There are times when two or more competing interests come together in this space, and that’s wonderful, but there are times when they don’t. When I go back and read three weeks of posts and realize I barely touched on how diabetes affects me personally, I realize I’m losing Stephen in the process. Stephen doesn’t need all of the attention, but he deserves a mention now and then (how’s that for third person?). Returning to telling my story a little more often is a goal I’ll carry forward. This is definitely more varied and more detailed than I thought I could handle when I started this thing. What’s really weird is that I have the feeling I’m capable of handling a lot more. So if I have any detractors, I’m sorry to disappoint you. Actually, I’m not. I’m going to keep writing for a while. I would be remiss if I didn’t say thank you to… You. Without your feedback, I could still write… but it wouldn’t be nearly as fun, and I certainly wouldn’t have learned as much as I have. I still want to jump out of my seat when I see a comment for the first time, and I thank you for helping to keep my head straight, while at the same time feeding my ego. I hope the next year brings you peace and happiness, and a cure for diabetes. In the meantime, I’ll have a slice of birthday pie (it’s a thing for me) in your honor. Thank you so much for a great year. Here’s to an interesting, inspirational, and fun year three!